Last Saturday I was delighted to be in attendance when The Caramoor Festival presented Poulenc's Dialogues des Carmelites in French*. At the end of the evening I had a feeling of being swept away in Poulenc's lush harmonies and dazzled by amazing singing. This semi-staged performance (directed by Victoria Crutchfield, daughter of Opera at Caramoor Director Will Crutchfield) had more detail and direction than some fully staged opera productions I've seen. A lot can be done with a single piece of furniture and a wimple. As I say, the singing was amazing. Jennifer Check was rewarded with hearty applause and shouts of "Brava!" at the curtain for her Blanche de la Force, and one could certainly tell why. Although I've always wished for a warmer sound from Ms. Check, I found her performance of the fearful, indecisive Blanche satisfactory. I found Hei-Kyung Hong's Madame Lidoine much more than satisfactory. 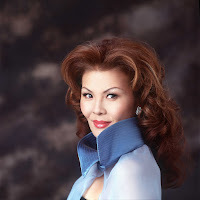 Ms. Hong has been moving into roles much larger than the coloratura roles that made her career in the 80s and 90s. This was a full, warm sound, with sure command of Madame Lidoine's demanding vocal range and challenging melodic lines. Ms. Hong portrayed the role with dignity and a warm authority. Also impressive was Jennifer Larmore, who pleased so much singing Eboli in Caramoor's Don Carlos, as Mother Marie. Vocally secure and free throughout, she was in full command of Mother Marie's equally difficult demands. Ms. Larmore made Mother Marie earthier than Madame Lidoine but no less dignified. Veteran dramatic soprano Deborah Polaski was an exciting Old Prioress. Not to be repetitive, but Ms. Polaski also sang beautifully and acted the heck out of the challenging role. Her deathbed scene was a marvel. Young and promising Alison Jordheim offered a beautifully sung Sister Constance, full of hope and cheer even in the face of disaster. Caramoor veteran Daniel Mobbs gave a powerful, sonorous performance of the Marquis de la Force, although he was occasionally overpowered by the orchestra. Noah Baetge offered a passionate and well sung Chevalier de la Force. The Orchestra of St. Lukes, as usual, played with sensitivity and care under Mr. Crutchfield's baton, and the chorus of Caramoor Young Artists and Caramoor Apprentices was quite good. *While it's true M. Poulenc did specify the opera should be performed in the local language, stated Mr. Crutchfield, that was before the days of supertitles.